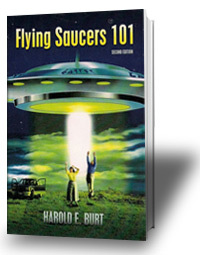 Flying Saucers 101 by Harold Burt is the most complete reference book on UFOs and related phenomena you can find anywhere. It reads like a novel on Flying Saucers, the Face on Mars, Crop Circles, Cattle Mutilations, Roswell, Alien Abductions, Missing Time, and much more. Flying Saucers 101 is the most complete and straightforward presentation of the UFO/Extraterrestial phenomenon. Here is the best chance to get all the answers in a single book.